An experienced greeter since 2015, Champ thinks that all dogs and humans should be his best friends. When he is not sneaking naps on the couch at home (bad dog), he enjoys joining Aaron in the office on most Friday afternoons. 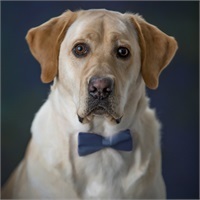 Champ is a distinguished graduate of Jerry Sather’s Labs Unlimited field training program. He graduated with honors: Magna Bark Loudly. During pheasant season you can find him with Aaron in fields throughout Minnesota and South Dakota.